I started with a 7" x 5" card base. Expressions Textures Embossing folder called Lace. I matt and layered the embossed card onto a piece of purple card and glued it to the base card. to a piece of plain white card measuring 6.5" x 2.25"
and glued them to each edge of the white card. I glued a smaller piece of scrap chipboard onto the back of the white card, and then glued this directly onto the embossed panel to give it some support and dimension. Finally I added some small punched flowers and diamanté gems to decorate. great inspiration from the girls on the design team. This is such a sweet card, Janice! The tiny yellow flowers are such a great touch and I love all the texture on this! Perfectly adorable for any birthday! Love your color combo and design! Thanks for fabulous inspiration Janice! 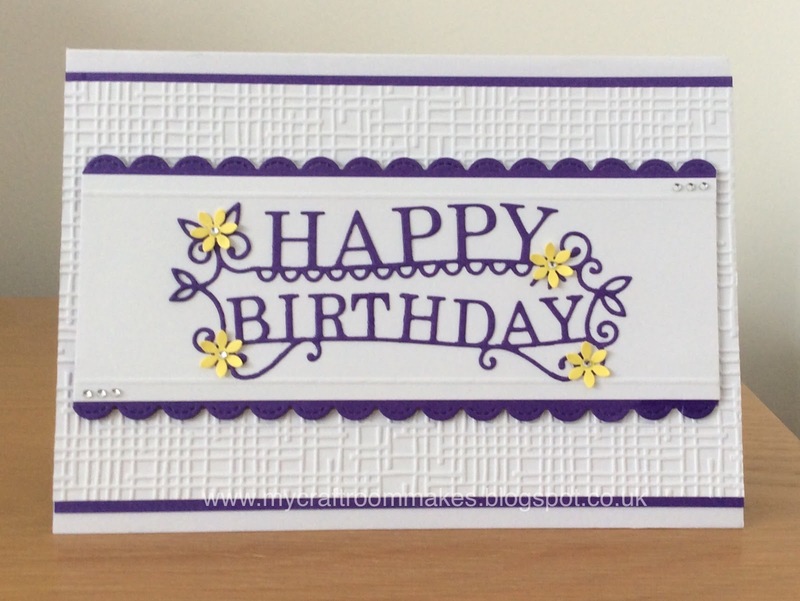 Wonderful layering on this card and love that embossing too. Like how you put the Happy Birthday front and center on this for a real attention getter. Thanks for sharing your inspiration with us. Love that texture and your delicate flowers! The HB die is awesome! so pretty, I love the texture behind the sentiment and the purple and yellow are such a pretty color combo! Janice your card is so cute!!! adorable.... love the background. Wow! Beautiful card, Janice! Lovely borders and wonderful textures!